Just a few dozen yards from the “front door” of Veterans Field positioned along 160th Street, stands a ships “screw” erected when Memorial Park was dedicated. Not a generation ago, 160th was a 2 lane county road which led to PLHS (now Twin Oaks Middle School), and beyond to Savage and Burnsville past a community park with a ball diamond set back among majestic oak trees. As alluded to in the below submission from local resident and PLHS alumni Kevin Busse, there are many stories about the park, once at the “edge” of Prior Lake as many older ballparks are. The Memorial has hosted over many years in the history of Prior Lake, a destination concluding a Memorial Day parade route and an annual recognition that had been moved to Twin Oaks as a spot to remember those who have served our nation but has moved back to Memorial Park in 2018. Tales of a limestone mining pit beyond the ballfield, an apple orchard, an effort to keep highway 13 close to downtown business district blocking a different proposed path, an attempt to purchase and aircraft propeller as a monument and many more weave together mingling truth with rumor to form a fabric and reflection of the community. The baseball facility, Veterans Field (“of or at” Memorial Park) was dedicated and named as following upgrades that resulted from the 1997 Parks and Library referendum. The current concession building and stamped concrete patio as well the defined parking area the most visible result of that effort. The field lighting and grandstand were efforts led by local leadership and private funding, including PL baseball Legend Jack Andrews, and funded by donations and support led by PL VFW Post 6208. A notable connection between Prior Lakes past & present in the article documents the role of local baseball supporter Earl Hafermann in the 1940’s helping lead to the parks establishment. His great grandson Parker Hafermann is a member of the 2018 Prior Lake Lakers high school baseball team that plays its home games at Veterans Field. The park has amenities enjoyed not only by thousands of baseball fans annually, but by families enjoying the pavilions, basketball court, horseshoe pits and playground as well walking path cutting a ribbon through the park from 160th and Franklin Trail to Grainwood Elementary, Prior Lakes 1st “new” High School. When you drive by, pause to reflect the parks meaning. Park your car and walk to the monument and think both of those who made the ultimate sacrifice and their families and thank them for the park that is dedicated, in part, to honoring their memory. As a lifelong resident of the Memorial Park neighborhood in Prior Lake, I’ve always been intrigued by the history of the park, and the ship propeller memorial that honors those who served our nation in military service. Many years of research led to plenty of dead ends, false stories, and bizarre rumors. Several people I spoke with felt that the ship propeller came from Cargill in Savage, who made ships for the military in World War 2. Other stories said it was captured from a German or Japanese warship. Some said it wasn’t from a military ship at all. Several additional stories all proved false and misleading as well. A few years ago, while reading the Prior Lake American newspaper, I noticed an article by Bonnie Grapper mentioning the Prior Lake Lions Club involvement in purchasing Memorial Park property and erecting the Ship Propeller Memorial. Thanks to Bonnie and the members of the Lions Club, who allowed me access to the recorded minutes of Lions Club meetings going back to the mid 1940s, I have been able to piece together the parts of the puzzle explaining much of the history of Memorial Park, and the Ship Propeller Memorial. What I found was that the Propeller has been a source of community honor and pride for many decades, although it took some hard work by many groups and individuals to make it happen. In the mid 1940s, a small baseball field occupied some property on what was then the far eastern side of town. In July of 1947, Lion President Kemp called for the formation of a Baseball Park Committee to begin research into what would be involved in acquiring the property to be made into a community ballpark. The owners were contacted about a final price and their terms of selling the property. Lion Schmokel was placed in charge to make plans on how to finance the purchase, and by November of that year Lion Club member Dr. Kortsch motioned that a committee of Lions meet with a committee from the VFW to attempt to buy the land then referred to as The Ball Park. In February of 1948, Lion Art Jelinek made a presentation to the club on some of the methods available for the development of a Memorial Park. It was announced at this meeting that the discussion to decide whether or not to purchase the ball park property for a Memorial Park resulted in an overwhelming majority in favor of the purchase. To have a proper Memorial Park, it was decided that the park needed some type of a monument to honor the men who served in Military Service. In 1946, following World War 2, the Office of Emergency Management in Washington, DC, established the War Assets Administration. Their purpose was to distribute and dispose of surplus war property and decommissioned military items that were used by the United States in the war. The Lions Club began to research the possibility of purchasing some type of United States military vehicle or item that could be displayed as a monument or memorial. 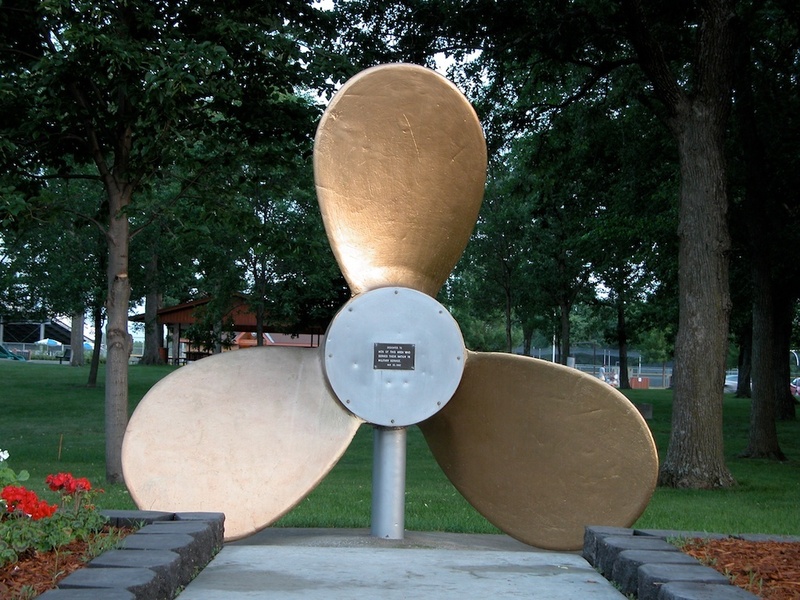 With Prior Lake being a popular lake resort community at the time, the club made a decision to purchase a large ship propeller, and in April of 1948, Del Cates motioned that the Lions send in a purchase order to the WAA for the propeller, which was unanimously approved. Two days later, Walter Maves made a motion to the Lions Club that members make themselves familiar with the surroundings of the Memorial Park property, and to submit drawings indicating their views on how the park should be laid out. By early May, Earl Hafermann proposed that a clean-up day be held at the park on May 27th. Every able-bodied man, woman and child were asked to “lay aside their chores and duties of the day and come out to the park at 4pm, with the intention to make a valiant effort to clean out the woods and thereby more beautify our Memorial Park.” The Lions Club also agreed to serve hot dogs and beer so as not to interupt the working schedule at meal time. Afterwards, Del Cates motioned that a committee be appointed to proceed with their building plans to begin construction of the park. In June of 1948, the War Assets Administration office in Duluth notified the Lions Club that the ship propeller had arrived, and the club accepted an offer of $40.00 by Ray Nacey to make the trip to Duluth to pick up the propeller by truck and transport it back to Prior Lake. Lion Al Cameron made a motion to the club in January 1949 for a Centennial Celebration, and that the park be dedicated, along with the Ship Propeller Monument, as part of the celebration. It was seconded by Walter Maves, and unanimously carried. In July of 1949 Earl Hafermann led a discussion on payment options for the fence around the field and grandstand at the ball park. An additional discussion took place regarding the cleaning out of the park reserved for picnic grounds and the monument. Gayle Carpenter and Bill Kennedy made the motion that the Lions Club clean up the front part of the park and pay for any expenses involved “up to the extent of $50.00”. The decision was made to fence in the picnic grounds to hold 25 sheep, which would eat the grass and brush to clean up the area. By August of 1949, Lions Cates and Russell made a proposal that the Lion’s Park Dedication Committee get together with the VFW Dedication Committee and the Village Council to make plans for an early dedication. At 12:30pm on October 13th, Lions Club members went to Village Memorial Park, as it was being referred to at this time, to roll up and remove the snow fence, which had been used to enclose the hungry sheep while they cleaned up the brush. 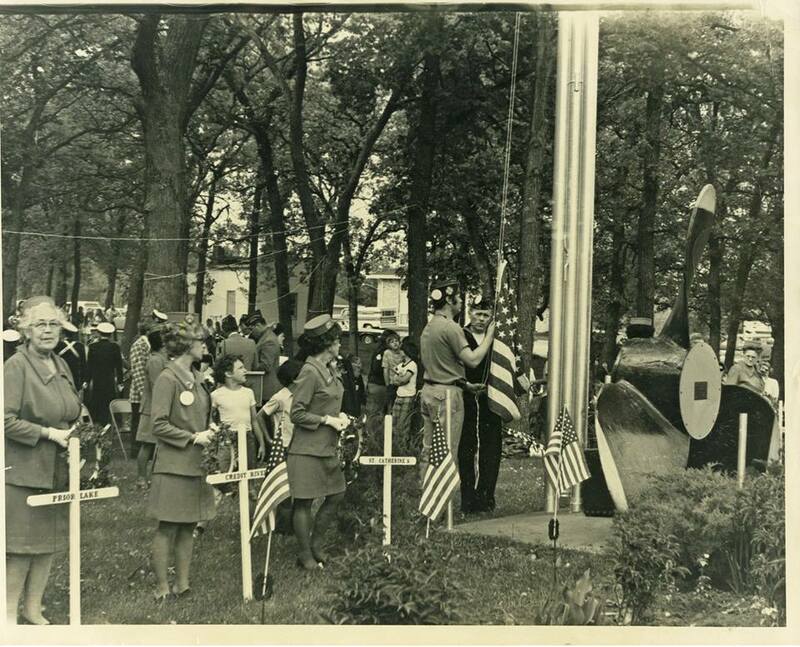 In the fall of 1949, Village Memorial Park was dedicated. The propeller was installed, laying flat on the ground, in the area of what is now the picnic shelter. Keep in mind that Memorial Park looked quite different back then. Until the mid-1960s, the ball field was laid out in the opposite direction. What is now the grandstand and the left field line was then the outfield, with the large covered wooden grandstand originally located in the grassy area outside the right field line fence by Memorial Trail. Not much exists for records of the park in the 1950s. The unmarked Ship Propeller Monument became a playground of sorts, as children used the slanted propeller blades to slide down, and the open center was often used as a fire pit by park patrons, covering the Monument in soot and ashes. Something happened by 1961. A renewed Patriotic pride swept Prior Lake. Local businesses advertising in the Prior Lake American newspaper had American Flag graphics placed in their ad copy, the Stars and Stripes were flown everywhere on homes and businesses. The call went out to take the neglected Ship Propeller Monument and make it into a proper Veterans Memorial, and the residents of the Village of Prior Lake took on the task with passion. The decision was made to erect a special Memorial in honor of the war dead of this area. The Lions Club, Business and Professional Organizations, The Fire Department, and VFW Post #6208 all stepped forward to donate funds for the project. Ephraim Beaudette designed and constructed a 60 foot Memorial Flag Pole for the park. Jim Cates, the project chairman, spent many hours of his time for the community. Harold Monnens, Tony Conroy, Mike Neiland, Bud Ryan, Roger Harris, Otto Johnson, Joe Link Jr., Florian Blumberg, Henry Schroeder, Harold Busse, Jim Ludowese, Norbert Borka, Philip Porter, Bobby Jones, Gordie Hennen, LeRoy Bohnsack, LeRoy Gutzmer, and many others contributed in a variety of ways to construct the Memorial. On Memorial Day, parade participants assembled in front of the VFW club at 9:30am. Starting at 10 o’clock, the parade route began its journey along old highway 13 towards Memorial Park. A throng of over 200 people filled the picnic grounds at Memorial Park, one of the largest public gatherings in the history of the Village of Prior Lake at that time. As the parade entered the park at 10:20am, the Prior Lake School Band began to perform. Promptly at 10:30, VFW Post Commander Mike Barlage greeted the crowd and introduced Mayor Melvin Borchardt. The Mayor introduced First District Congressman Ancher Nelson who gave a rousing speech that was met with a lengthy applause. Congressman Nelson then presented a flag for the new Memorial that had been flown over the Nation’s Capitol especially for the dedication, which was accepted by Jim Cates and Harold Monnens. At exactly 11:00 the silent audience all stood at full attention as the flag was raised on the Memorial Flagpole while the School Band began to play the Star Spangled Banner. Members of the VFW and Auxillary then began the ceremony. Boy Scouts, Cub Scouts, and members of the Reserve also participated. Ed Meyer of Fairmont, Minnesota, past Second District Commander, delivered an emotional Memorial Day speech in front of six mock graves, representing the six cemeteries the VFW club visits each year. Following the Memorial Service and Dedication, a community picnic was held in the park. Families stayed in Memorial Park all day long enjoying the grounds and the time together as a community. This is our Park, our Memorial, and our History. Some towns have a steam railroad engine to show community pride, or a military tank or helicopter to honor their war veterans. Prior Lake has a Ship Propeller, an authentic piece of World War 2 United States Military History on display in a beautiful city park for all to enjoy and to remember those who served our country. I challenge the city of Prior Lake, the community groups and organizations, and our residents to follow the lead set all those years ago by the local Lions Club, to once again step forward to preserve and honor the historical buildings and locations in our community before they’re lost forever.